Using high resolution, infrared photography developed by NASA for research on Urban Heat Islands, new strategies are emerging for improving the overall environment of urbanized areas by lowering ambient temperatures and reducing energy usage. The study of Urban Heat Islands is an emerging science which during the last few years has become the focus of major research projects at NASA, EPA and DOE as well as respected universities. While more definitive studies are continuing, it is clear from the data that the built environment, and corresponding lack of vegetation, is several degrees warmer (2 to 10 degrees F) than nearby natural environments. Moreover, certain structures, especially asphalt parking lots and dark roofs, are much hotter and retain heat longer. Modeling suggests that by increasing the reflectivity (albedo) of these surfaces, planting more trees, and reducing the capacity of these structures to store heat, the high ambient temperature can be reduced, providing many direct and indirect benefits to the environment and our health. It goes without saying, that the cooler your house, or business, is in Summer and the warmer it is in Winter, then the lower you gas expenditures will be. Another important consieration to cheape gas bills, is the ability to shop around for you gas supplier.Business gas prices.com allows you to do just that. It is the only independent comparison site run by experts.Get your place cooler and save money at the same time! 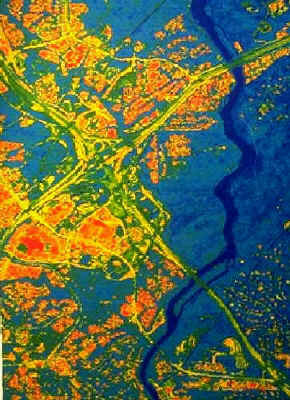 This NASA high altitude infrared scan of the I-75/I-285 Interchange near Cumberland Mall in Atlanta, Georgia.